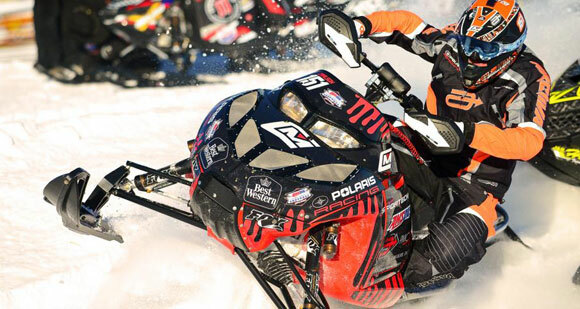 After a breakout podium performance on the challenging ski-hill course in Michigan by Andrew Carlson, the Carlson Motorsports team faced adversity on the postage stamp sized track in Shakopee, Minn. as both Pro riders failed to make the main event due to tough luck and what the team calls a questionable officiating call. Levi Ensrud (far left) and Dave Otto (far right) of the Carlson Motorsports crew helped Ryan Springer (center) make the final and post a third place podium finish in the Sport class final. Despite the team’s tough weekend, it was still ready to help out National Sport rider Ryan Springer. Springer was first introduced to the Carlson Motorsports team while racing at the team’s ERX Motor Park snocross facility last winter and he was in jeopardy of missing the next round due to mechanical issues. The effort paid off for both Carlson Motorsports and Springer, who found himself with a third place podium finish in Saturday’s Sport final. True to his colors, Ryan was gracious during his podium interview, giving many thanks to the Carlson team and their mechanics, which allowed him to make the final and ultimately the podium. As for Pro-Open athlete Johan Lidman and Pro-Lite rider Andrew Carlson, the weekend failed to live up to expectations but their struggles have made both riders more determined than ever.